When attending my first meeting of the North Carolina Specialty Food Association last week, I was given the opportunity to introduce myself and say a few words about our product. I wish I had thought to say, "It's the real thing every time all the time." More and more I am coming to understand how few folks in my area have really tasted truffles or fallen under their spell. 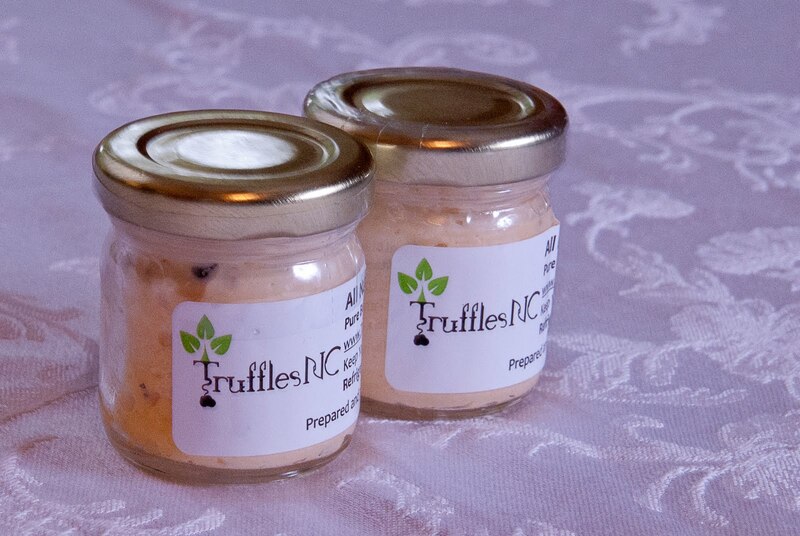 You see, a lot of folks who have tasted truffle flavored dishes or bought truffle oil or other truffle products really haven't tasted truffles. They have tasted truffle flavoring and there's a BIG difference. Truffles (Black Winter Perigord Truffles) have a flavor that's almost impossible to describe. Some of the words I have used are "earthy, mushroomy, musky, nutty and olive-like" but none of those words really describe the truffle flavor. It's a powerful flavor and aroma but it isn't like "truffle flavoring." It's not that it isn't good -- it's just very different. Next time you buy a truffle something, ask some questions. See if you're getting the real thing or something that's just truffle flavored.